Constructed 2 1/2 Dimensionals from ready made, found, personal made and distressed objects. 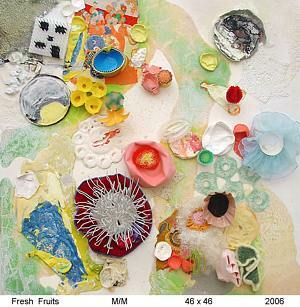 One day when I was walking around Cambridge Massachusetts I found a book called Fresh Fruits by Aoki: . It is a collection of photographs of Tokyo teenage street fashion portraits. It really helped to free me up and use all of the objects that I have been collecting over the years to embed and paint with on the canvas. Since I lived in Japan as a child, the Japanese influence gives me a sense of comfort. It is a continuation of The Skin Series.